Type of diseased blood vessel common among PAD patients. Photo credit: Lutonix. The Emory Heart & Vascular Center is one of the first in the nation and the first in the Southeast to offer a new treatment option for people suffering with peripheral arterial disease or PAD. PAD is a life-threatening condition where plaque builds up in the blood vessels that carry blood from the heart to the arms and legs, hardening and narrowing those arteries and causing poor circulation. The new drug-coated balloon (DCB) catheter, Lutonix 035 DCB, is similar to a standard balloon catheter used to open arteries, but it also releases a drug from the balloon surface to the treated area that helps reduce future narrowing and improve blood flow. It is the first and only DCB approved by the US Food and Drug Administration (FDA) for the treatment of PAD in the femoropopliteal artery. "We are thrilled to be among the first hospitals in the nation offering this new treatment option, reinforcing our commitment to bring the latest innovations to our patients," says Emory Healthcare interventional cardiologist Khusrow Niazi, MD, associate professor of medicine (cardiology) and director of peripheral vascular intervention, Emory University School of Medicine. Two patients, who have had recurrent blockages, have been successfully treated with this device at Emory. 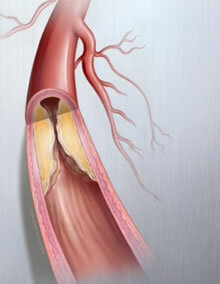 PAD in the femoropopliteal artery, a large artery in the thigh, affects millions of Americans and, according to the National Institutes of Health, puts those patients at high risk for lower-extremity amputation, particularly in people over the age of 50. The successful treatment of PAD requires improved blood flow (patency) for longer periods of time. Minimally-invasive endovascular procedures such as angioplasty balloons and stents, medications and vascular bypass surgery are some of the accepted ways to treat PAD, but a major limitation of these options is re-blockage of the vessels. According to Niazi, the Lutonix 035 DCB delivers the drug and inhibits the regrowth of the plaque. "This therapy is a major advancement in the treatment for blockages that allows us to explore other treatment options as time progresses, a critical factor since PAD is a progressive and debilitating disease," adds Niazi. For more information about the Lutonix 035 DCB and other PAD treatment options, please call Emory Health Connection, 404-778-7777.